Frank Lloyd Wright's grandson Tim Wright and his wife Karen are now proud owners of a prefab house by Blu Homes. 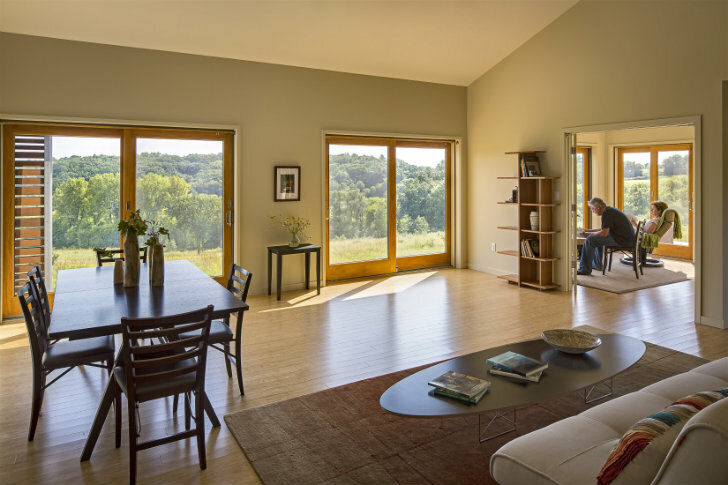 The two bedroom, two bathroom home is located on a 112 acre property near Taliesin East, the famous architect's former estate and now preservation museum in southwestern Wisconsin. The Wrights chose the Balance Blu Home as it was best suited to their needs and provided them a close connection to their surrounding property. Classic lines, generous glazing and smart design are all hallmarks of Frank Lloyd Wright's philosophy and are clearly seen here in this new prefab. Tim Wright, who is the grandson of Frank Lloyd Wright as well as a documentary filmmaker, writer, and teacher, often spent his summers at Taliesin as a boy. Now he and his wife Karen, who is a board member of Taliesin Preservation, live near the famous architecture mecca on their 112 acre property, where they are diligently working to restore 23 acres to native tall prairie grass. The couple selected the Blu Home’s Balance model to build on their property. Blu Homes has also unveiled the latest update to their classic Balance Vista model, which is organized around a spacious great room and kitchen. The two bedroom, two bath home offers 2,212 sq ft of living space and 16 foot high ceilings. More storage and closet space and a full wall of sliding glass doors are part of the upgrades to the prefab home. Prices for the 2014 Balance Vista start at $465,000. Tim Wright, who is the grandson of Frank Lloyd Wright as well as a documentary filmmaker, writer, and teacher, often spent his summers at Taliesin as a boy. Now along with his wife Karen, who is a board member of Taliesin Preservation, Tim lives near the famous architecture mecca on their 112 acre property. They are diligently working to restore 23 acres of the property to native tall prairie grass. 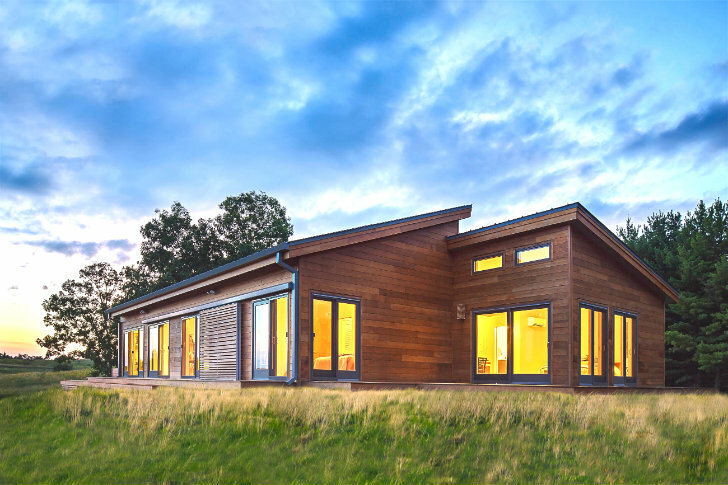 The couple selected the Blu Home's Balance model to build on their property. “The Balance was the Blu model that suited our needs the best . . . it’s a beautifully crafted house, and it’s so reassuring to know that the person designing your house is also manufacturing it, and is going to deliver it with a crew of talented people who will put it up on site," explains Tim Wright. Blu Homes has also unveiled their latest update of the classic Balance Vista model, which is organized around a spacious great room and kitchen. The two bedroom, two bath home offers 2,212 sq ft of living space and 16 foot high ceilings. More storage and closet space and a full wall of sliding glass doors are part of the upgrades to the prefab home. Prices for the 2014 Balance Vista start at $465,000. Interior rendering of the generous open floor plan living and kitchen area.